﻿Orthodox Christmas Day: Calendar, History, Tweets, Facts & Activities. Orthodox Christmas celebrates the birth of Jesus Christ. For Christians, it is a is a 12-day season that begins on December 25th and ends on January 5th. The Nativity of Our Lord is one of the 12 Great Feasts in the Orthodox Church. It is sometimes also called The Incarnation of Christ to indicate that God became man in Christ to live in the world. Orthodox Christians follow the Julian calendar which places the day on January 7. The majority of Christians follow the modern day Gregorian Calendar which places Christmas on December 25. My many friends of all faiths include Orthodox Jews and Muslims have wished me Merry Christmas. I am sorry the media has psyop'ed Americans into believing everyone hates each other. Mainstream reporters NEED people killing each other for wars, and big money (ads). Choose love. In the Orthodox tradition, a 40-day period called the Nativity Fast occurs before Christmas. Fasting is a faithful abstain from foods, especially those derived from animals, and wine. In the old days, Sundays honored the old covenant between God and Abraham and now - the new covenant between God and those who believe in Christ. The Orthodox tradition uses icons - paintings of saints, to help people to pray. The main icon for Christmas features scenes from the birth of Christ. The giving of gifts started as a Roman tradition. Although the early church fathers condemned the practice, it continues to this day. Several feasts are held during the Orthodox Christmas season, including feasts for Mary, Joseph, the first-born children slain by Caesar, and Jesus' circumcision. 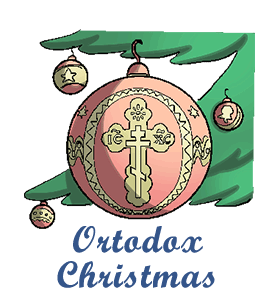 Attend an Orthodox Christmas service. Orthodox Christianity is popular in Greek and Slavic-language communities, including Bulgarian, Russian, Serbian, Macedonian communities. Go on a fast or diet leading up to Orthodox Christmas. Try eliminating meat and animal foods from your diet. Go for dinner at the Russian or Greek Restaurant. Many will serve specials to commemorate this holiday.